At bin on the lake, cuisine is never an afterthought. We believe that something extraordinary happens when food and spirits are skillfully paired, amplifying the unique flavors of each. bin on the lake's cuisine highlights locally-sourced ingredients that capture bright, seasonal tastes of the Northwest with a Mediterranean influence. Known for our exceptional wine list, we have over 40 wines by the glass in 1, 3 and 6 oz. pours, in addition to refreshing signature cocktail offerings. 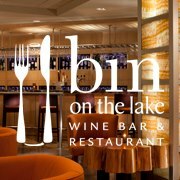 Best of all, bin on the lake is a relaxed and stylish wine bar that serves Happy Hour from 4:00 PM - 6:00 PM. Located at the heart of Carillon Point on the shores of Lake Washington, our passion for serving good food and great wine is matched only by the view!